Jump-Jop-Hop Explosion is a workout designed to functionally enhance the body’s ability to perform “ in this case, the body’s ability to defy gravity. The workout is not only intended to increase one’s vertical, but also to protect one from injury, as well as to improve one’s strength, flexibility, cardiovascular endurance, coordination, agility, power, speed, and reaction. This workout incorporates jumping (two feet to two feet), jopping, (two feet to one foot), and hopping (one foot to same one foot) in all three planes of motion for the purpose of loading and unloading the body differently for any and all types of activities. 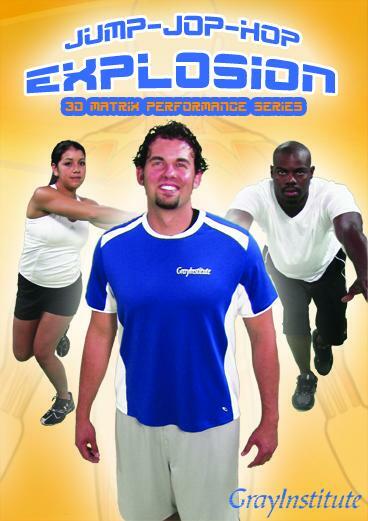 Jump-Jop-Hop Explosion is for multiple levels and ages of individuals, not just the elite athlete. More importantly, it is designed to enhance one’s overall health, wellbeing, and longevity by creating an environment where one can expand his / her functional threshold. Understand proper definitions of jumping, jopping, and hopping. Utilize positions and motions to authentically load (lengthen) and unload (contract) the body functionally as it relates to jumping, jopping, and hopping. Experience a logical sequencing of 18 different matrices (three-dimensional organization of movements).